Originally I planned on reading this book in May since I finished Sapphire Blue, the second book in the trilogy just yesterday, but I decided to buy this book for myself and it sadly won’t arrive until June 1st. I have re-read this book countless times and have, and always will, adore it. The characters all have my heart and the storyline is a whirlwind of fun, adventure and romance! It follows a girl named Gwenyth who comes from a family of time travelers, however it is her cousin Charlotte who is destined for the gene. But one day Gwenyth is flung back in time and she realizes it isn’t Charlotte who has the gene, but herself. Secrets unravel about her and she is suddenly thrust into unknown waters. It doesn’t help that her new time traveling partner, Gideon, is annoying, arrogant, and incredibly handsome either; completely distracting. I read this book a few months back and what a fun ride it was. Now that summer is actually here, I am excited to give this summer adventure a re-read. 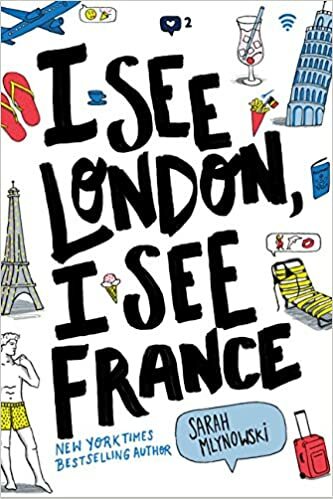 I See London I See France follows Sydney who has the perfect summer mapped out in Europe with her best friend, Leela. However, running into Leela’s cheating ex-boyfriend is not part of the plan, or falling for his very hot friend. While I did have some problems with this book, all I want for this month is to read some fun and easy books and this is definitely one of them! This is a book I want to pick up during the last week or so in June, or whenever I finish exams because it is a big one. I absolutely adore The Dark Artifices trilogy by Cassandra Clare so I am excited to re-read the first two books in anticipation for the third and final one which is being released in December! Lady Midnight follows a family of Shadowhunters (half human half angel) who try to unravel the mystery of Emma Carstairs parents’ death. It is filled with adventure, romance, and betrayal and I absolutely love it.